Everyone needs healthy oceans. But, we do not always have them because of chronic pollution and increasing demands to industrialize the ocean. Our great fish stocks and fisheries, in particular face the loss of nursery areas, destruction from power plants, and new threats from hormone mimics in the water. Full implementation of the U.S. National Ocean Policy is necessary to address the complicated and interrelated issues affecting the ocean and coastline we both need and enjoy. And everyone can play a role in making that happen. The Atlantic and its seacoast is woven into the fabric of our lives. Most of us have cherished memories of days on the beach, hours fishing, surfing or sailing the waters. It is part of our family histories and heritage. Many still make a living from our ocean and bays; the fish and shellfish they produce, or the harbors and ports they provide. The Mid-Atlantic marine economy brings $2 trillion (over 14% of U.S. gross domestic product) into the U.S. economy. In New Jersey alone, recreational fishing brings in over $1.9 billion in sales impacts to the state and generates over 13,000 full- and part-time jobs. Clearly, there are powerful emotional and financial reasons to keep our ocean and coasts healthy. Good stewardship of our ocean and coasts demands strong laws and policies, within a comprehensive framework designed to balance many competing interests. However, decisions affecting the ocean have long been made by a multitude of state and federal resource agencies. Unfortunately, we have seen the inability of these bodies to break free of the decades-old, specie-by-species, agency-by-agency decision-making approach. That fragmented process has led to conflict with and mistrust by citizens, industries and even other decision-making bodies. Amidst that our ocean and coast have suffered. Implementation of our comprehensive U.S. National Ocean Policy, in part brought to life through regional ocean planning, aims to change the process to reflect what fishermen and coastal citizens already know: our ocean and coasts are intertwined and require a more coordinated management approach based on solid data and local stakeholder involvement. Ocean planning is exactly what it sounds like: creating a plan for how to sustainably use and protect our ocean and coastal regions. It doesn’t create new laws or regulations; there are enough of those already. Instead, it creates a process that puts all agencies, state and federal, with existing authority to protect and manage our ocean and coastal resources, in a room with stakeholders with the directive that they work collaboratively and efficiently to ensure a healthy Mid-Atlantic ocean for this and future generations. 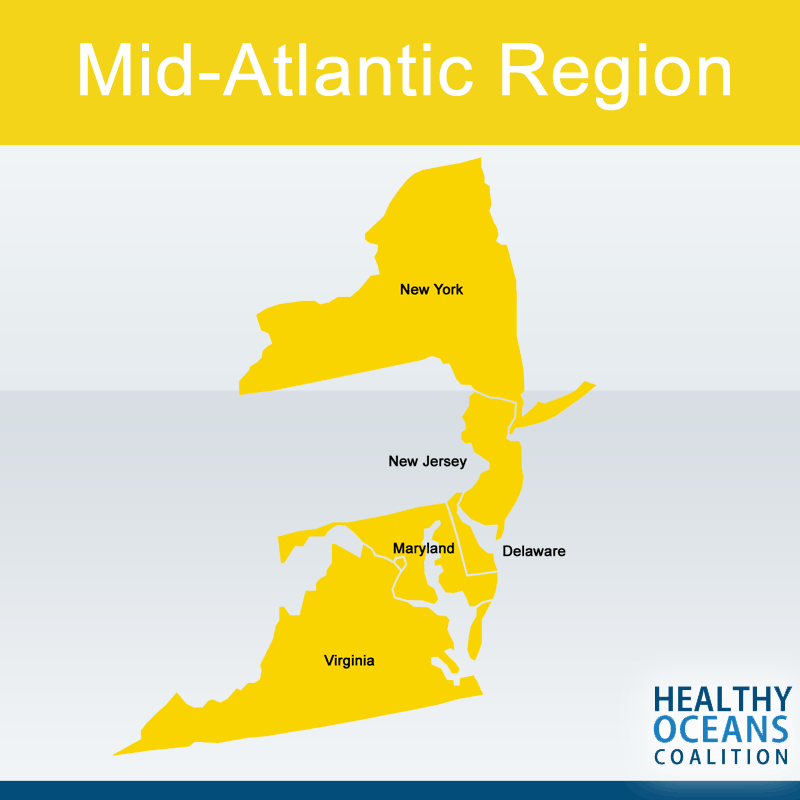 The Mid-Atlantic States, federal agencies, and the region’s federally recognized tribal nations realize this and are now on track to complete the region’s first ever ocean action plan next year. This is an incredible milestone for our state and region, as the plan will guide future conservation and sustainable use of our ocean and coastal resources. It is also a perfect opportunity for citizens and ocean users from around the region to become involved. Ocean planning, like anything, comes down to what people put into it. We have an unprecedented opportunity to ensure this plan reflects our input and becomes a tool we can all use to ensure our government is efficient and wise in how it manages and protects our region’s diverse marine ecosystems and the marine wildlife that depend upon them. This group of agencies and tribal nations (collectively called the Mid-Atlantic Regional Planning Body) will meet in Norfolk, Virginia September 22-24 and they are asking us to step up and tell them what we need and if their efforts fit our needs. In the end, the answer to the failure of current practices and policies is not to keep complaining about what does not work, but to create new pathways to better and more effective management. Full implementation of the National Ocean Policy and Mid-Atlantic ocean planning is one such pathway. As the communities most closely tied to the ocean, we should embrace ocean planning and urge our elected officials to do likewise. Because the one thing we should all be able to agree on is that everyone needs healthy oceans. For more information about the American Littoral Society or to become a member, please visit www.littoralsociety.org.